(About) Map shows the growth of the United States and the expansion of slavery. One of the most divisive and hotly debated subjects in both houses of Congress in the United States for several decades was whether to contain, abolish, or expand slavery in newly acquired territory. The Compromise of 1850 was the result of the United States gaining lands and expanding its borders over sixty percent in just four years. Compromise of 1850 and Expansion of Slavery Map. PBS. The Compromise of 1850 consisted of five bills addressing issues related to slavery. The five bills passed into law during September of 1850, and provided for slavery to be decided by popular sovereignty in the admission of new states, prohibited the slave trade in the District of Columbia, settled a Texas boundary dispute, and established a stricter fugitive slave act. Following the American victory in the Mexican War (1846-1848), the question of whether to allow or prohibit slavery in the new territories threatened to split the Union. Slavery’s expansion into new states could grant the slaveholding South a majority in the Senate, but its prohibition would easily tilt political power in favor of the North. In the Compromise of 1850, Congress admitted California as a free state; settled boundaries of Texas and New Mexico; created a territorial government for Utah; upheld the rights of slaveholders over escaped slaves; and banned slave trading in the nation’s capital. Instead of addressing the continuation of the institution of slavery in the United States, the question of whether or not the newly acquired territory would embrace or reject slavery was the question posed for nearly a century. 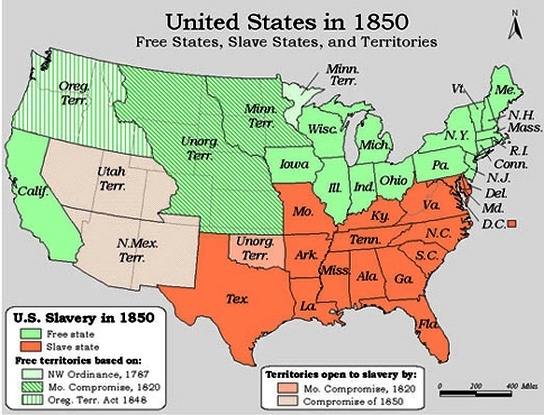 But with the United States expanding its territory more than 60% in only four years, it resulted in passionate debates and the final passage of the Compromise of 1850, which was a compromise aimed at retaining a balance between the number of free and slave states, as well as a few other slavery provisions. The Compromise of 1850 would fail because while four free states were admitted into the Union from 1850 to 1861, not a single slave state was added, causing an imbalance of political, social, and economic power, known as sectionalism, between the North and South. One of the five bills that would become law under the Compromise of 1850 was the uncompromising Fugitive Slave Act, causing many abolitionists to view the Compromise itself as a spurious agreement. As a result of the Compromise's failure to maintain an equitable balance between the sections of the nation, the American Civil War would commence in 1861. 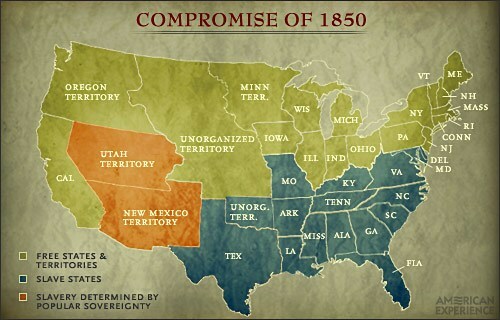 As the United States continued its westward expansion by procuring vast amounts of territory, the Compromise of 1850, as with all slavery compromises, failed to address the core issue of slavery itself. Politicians turned to compromises and endeavored to satisfy those who supported or rejected the spread of slavery into new territory. Will the newly acquired territory embrace or decline slavery, was the question posed for nearly a century. A house divided against itself can not stand, was often heard on the floors of Congress, and a nation that is half free and half slave must finally decide if it will be for or against slavery. But for decades neither side would make any major concessions on the subject of slavery, so to appease both sides of the aisle, compromises were continually drafted with the objective of maintaining an equal number of free and slave states, thus obtaining a balance of power. The lands obtained by the United States in less than one decade would tilt the balance of power and lead to the American Civil War. To purchase any quantity of territory by the United States was already a subject of much debate in Congress, but with the annexation and statehood of Texas in 1845, followed by the Mexican Cession in 1848 (officially the Treaty of Guadalupe Hidalgo), the nation had not only expanded its borders by more than sixty percent, but it finally obtained the dream of a country that stretched from sea to shining sea. But it came at a high cost and led to many contentious arguments on another subject, the expansion of slavery into the new land. 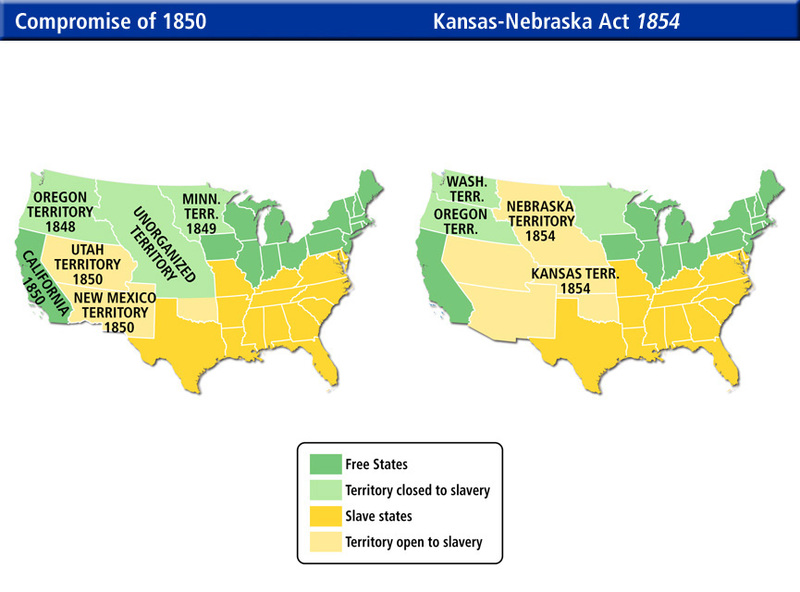 While both houses in Washington continued to debate the expansion of slavery, the Missouri Compromise of 1820 would pass, followed by the Compromise of 1850, and the Kansas Nebraska Act of 1854, which repealed the Missouri Compromise because it was ruled unconstitutional by the Supreme Court. The Treaty of Guadalupe Hidalgo in 1848, also called the Mexican Cession, was signed by the United States and Mexico on February 2, 1848, ending the Mexican War and extending the boundaries of the United States by over 525,000 square miles. In addition to establishing the Rio Grande as the border between the two countries, the territory acquired by the U.S. included the present-day of Texas, California, Nevada, Utah, most of New Mexico and Arizona, and parts of Colorado and Wyoming. In exchange Mexico received fifteen million dollars in compensation for the territory and the U.S. agreed to assume claims from private citizens of these areas against the Mexican government. 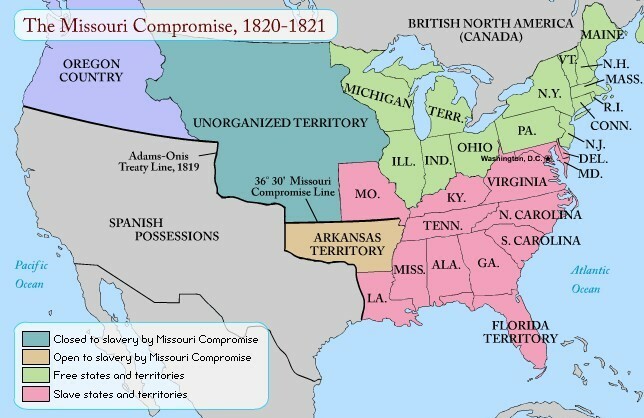 (About) The Missouri Compromise of 1820 was ruled unconstitutional by the Supreme Court and it was superseded by the Kanas-Nebraska Act of 1854, which also succeeded the recently passed Compromise of 1850. Comprises, however, continued to address the containment of slavery, but not the institution of slavery itself. The compromises would prove to be inequitable solutions, resulting in a divisive nation reconciling its sectional differences on the battlefields of the American Civil War. What the halls of Congress could not resolve on its floors, would be remedied in the shed blood of more than 600,000 men. 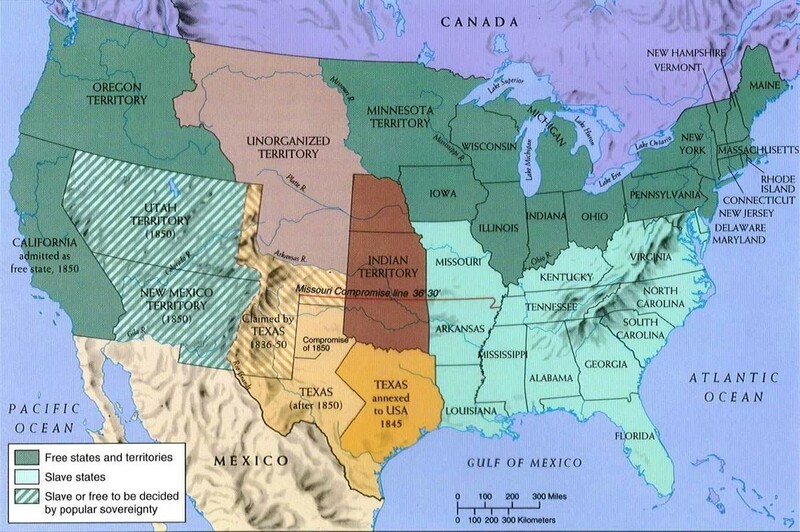 Map of What Caused the Compromise of 1850? Prior to the Mexican Cession in 1848, the nation hosted 15 free and 15 slave states, allowing a balance between the Northern and Southern sections of the United States. In 1850 California was admitted to the Union as free state, followed by three additional free states with Minnesota in 1858, Oregon in 1859, and Kansas in 1861. Since no slave states were added to the United States during the time it resulted in 15 slave and 19 free states, causing sectionalism and cries for secession as tensions had increased and brought the nation to the eve of the American Civil War. Slavery Compromise of 1850 & Fugitive Slave Law. 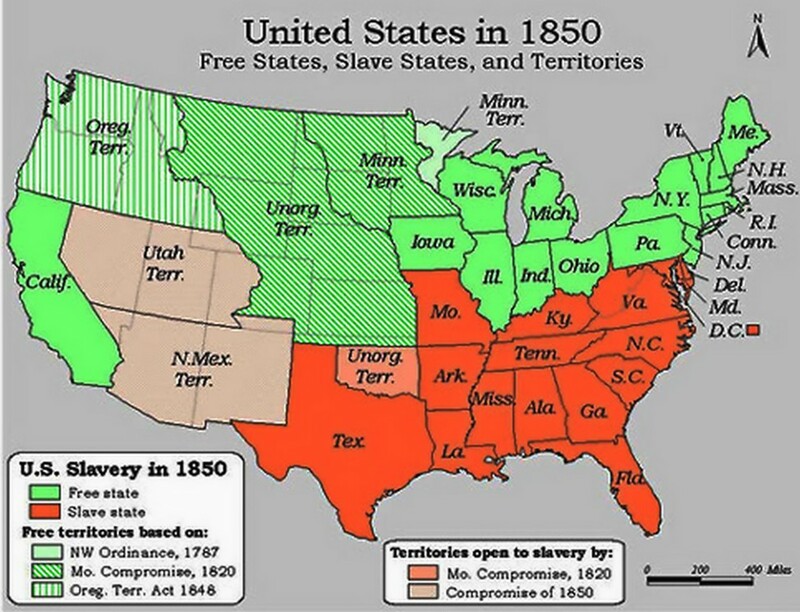 Map of Free and Slave States in Compromise of 1850. The most explosive element in the Compromise of 1850 was the Fugitive Slave Law, commonly known as the Fugitive Slave Act, which required the return of runaway slaves. Any black--even free blacks--could be sent south solely on the affidavit of anyone claiming to be his or her owner. The law stripped runaway slaves of such basic legal rights as the right to a jury trial and the right to testify in one's own defense. Under the Fugitive Slave Law, an accused runaway was to stand trial in front of a special commissioner, not a judge or a jury, and that the commissioner was to be paid $10 if a fugitive was returned to slavery but only $5 if the fugitive was freed. Many Northerners regarded this provision as a bribe to ensure that any black accused of being a runaway would be found guilty. Finally, the law required all U.S. citizens and U.S. marshals to assist in the capture of escapees. Anyone who refused to aid in the capture of a fugitive, interfered with the arrest of a slave, or tried to free a slave already in custody was subject to a heavy fine and imprisonment. The Fugitive Slave Law produced widespread outrage in the North and convinced thousands of Northerners that slavery should be barred from the western territories. Attempts to enforce the Fugitive Slave Law provoked wholesale opposition. Eight northern states enacted "personal liberty" laws that prohibited state officials from assisting in the return of runaways and extended the right of jury trial to fugitives. Southerners regarded these attempts to obstruct the return of runaways as a violation of the Constitution and federal law. The free black communities of the North responded defiantly to the 1850 law. They provided fugitive slaves with sanctuary and established vigilance committees to protect blacks from hired kidnappers who were searching the North for runaways. Some 15,000 free blacks emigrated to Canada, Haiti, the British Caribbean, and Africa after the adoption of the 1850 federal law. The South's demand for an effective fugitive slave law was a major source of sectional tension. In Christiana, Pennsylvania, in 1851, a gun battle broke out between abolitionists and slave catchers, and in Wisconsin, abolitionists freed a fugitive named Joshua Glover from a local jail. In Boston, federal marshals and 22 companies of state troops were needed to prevent a crowd from storming a court house to free a fugitive named Anthony Burns. 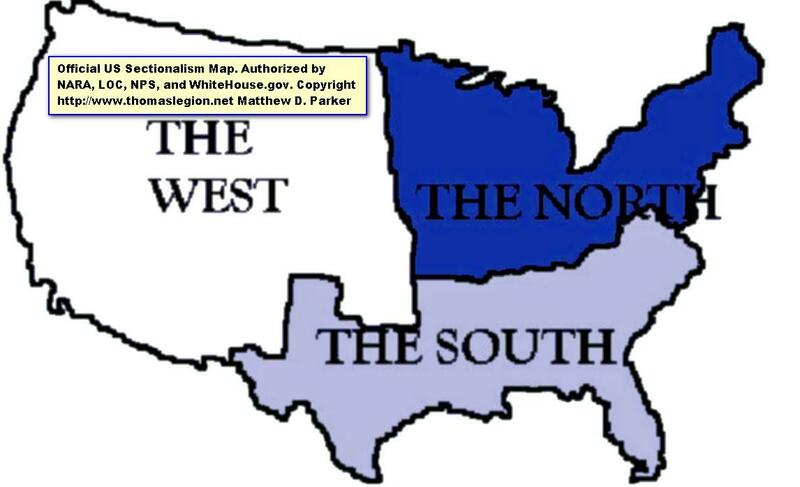 (About) Sectionalism Map. Sectionalism may be defined as excessive concern for interests of section, or causing excessive concern for the interests of one group or area to the detriment of the whole. 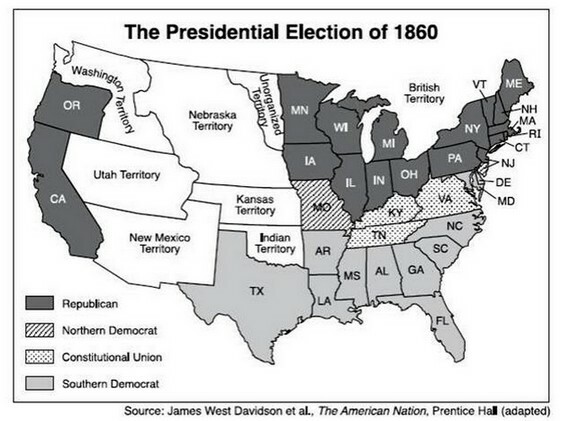 The sectional lines dividing the nation in 1850 have changed little when superimposing the Compromise of 1850 map over the present-day national political map showing which states generally vote for the Republican Party or Democratic Party. Recommended Reading: Henry Clay: Statesman for the Union. From Library Journal: Award-winning historian Remini has written the definitive biography on controversial 19th-century politician Henry Clay of Kentucky. Remini's work, which uses a rich array of primary sources, especially letters uncovered by the Henry Clay Papers publication project, surpasses earlier studies of Clay by Glyndon Van Deusen (The Life of Henry Clay, Greenwood, 1979) and Clement Eaton (Henry Clay & the Art of American Politics, 1962). Continued below…. All facets of Clay's life are examined, especially much new information about his private life and how it influenced his public political career. Remini analyzes why an accomplished political leader such as Clay could never be elected president, though he ran for the office five times. Clay's political success came from his extraordinary talents as the engineer who directed three major compromises between 1820 and 1850 through Congress, thus averting civil strife and keeping the Union together. This is an excellently written, superbly crafted, and long-needed biography that is suitable for academic and large public libraries. He conveys the subjects in easy to understand language to edify the reader's understanding (it's not like reading some dry old history book). Delving beyond surface meanings and interpretations, this book analyzes not only the history, but the historiography of the time period as well. Professor Potter rejects the historian's tendency to review the period with all the benefits of hindsight. He simply traces the events, allowing the reader a step-by-step walk through time, the various views, and contemplates the interpretations of contemporaries and other historians. Potter then moves forward with his analysis. The Impending Crisis is the absolute gold-standard of historical writing… This simply is the book by which, not only other antebellum era books, but all history books should be judged. Recommended Viewing: Africans in America: America's Journey Through Slavery, Starring: Angela Bassett, Jeremy Rabb, Andre Braugher, Eric Foner, and Kemp Harris. Review: "Everything you thought you knew about slavery is about to be challenged." So says WGBH about its six-hour series Africans in America, and they are absolutely right. Interviews with historians and luminaries such as General Colin Powell, dramatic re-creations of important events, and beautiful photography create a vivid and compelling story of over 400 years of tragedy. Ten million Africans died on the journey to America alone; they and the countless numbers whose lives were wasted in servitude find a voice in Angela Bassett's outstanding narration. At once scholarly and moving, Africans in America should be required viewing for anyone interested in the American condition. Sources: Mintz, S. (2007). The Compromise of 1850 and the Fugitive Slave Law. Digital History. Retrieved 16 Dec 2008 from digitalhistory.uh.edu; Library of Congress, National Archives, National Park Service, Ourdocuments.gov, US Department of State, WhiteHouse.gov, US Census Bureau, nationaatlas.gov; Hamilton, Holman. Prologue to Conflict, the Crisis and Compromise of 1850. Lexington: University of Kentucky Press, 1964; Holt, Michael F. The Political Crisis of the 1850s. New York: Norton, 1983; Stegmaier, Mark Joseph. Texas, New Mexico, and the Compromise of 1850: Boundary Dispute & Sectional Crisis. Kent, Ohio: Kent State University Press, 1996; Waugh, John C. On the Brink of Civil War: The Compromise of 1850 and How it Changed the Course of American History. Wilmington, Del. : Scholarly Resources, 2003.